Kayak Rolling is a skill you want to learn proper technique for from the beginning. Our experienced instructors make the difference between frustration and success. 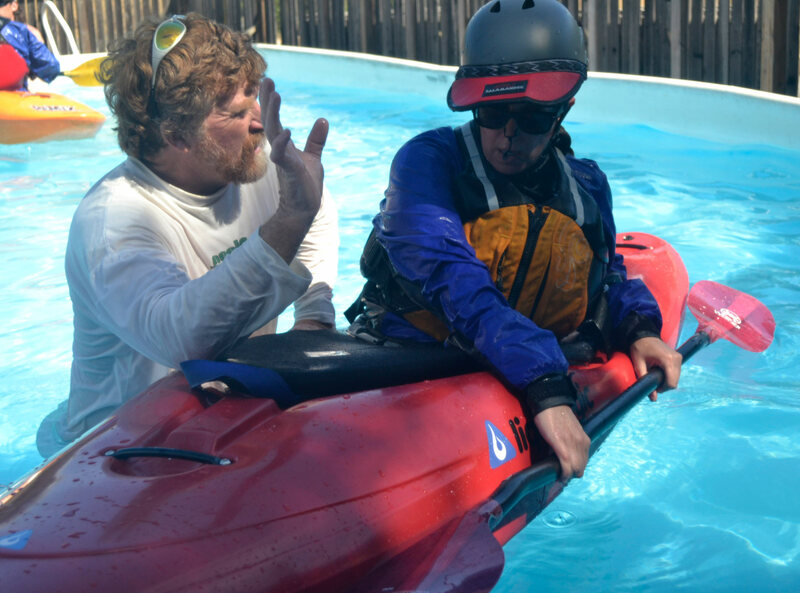 Unlike other instructional programs, we use our most experienced instructors to teach kayak rolling in our own on-site pool. One-on-one kayak rolling instruction in The River Store pool provides the best environment for mastering this counter intuitive maneuver. If you’re ready to learn to roll a kayak (offside, hand, back deck) or your existing roll only works part of the time, we can work with you to get it up to speed. typically a 2:1 student/instructor ratio or better! When: ALMOST Every Saturday 5:00pm, starting May through October and on a custom scheduled basis available on most days of the week to fit your schedule. Prerequisites: No true prerequisites for kayak roll sessions. River Kayaking 1 or Sea Kayaking 1 encouraged. Progression: River Rolling is the next class to consider once you have a reliable pool roll. Our kayak rolling program goes back 28 years or more and we pride ourselves on kayak roll lessons that actually help you learn how to roll a kayak efficiently, safely and effectively in the shortest amount of time possible.